Posted September 19th, 2018 by pristine & filed under House Cleaning Services. The kitchen is the centre of your home. It is where you prepare meals for the family and spend a lot of your time and for those reasons is one of the hardest to keep clean. Due to many day to day tasks you do in the kitchen, including food prep, it is one of the rooms in the house that requires constant attention. Because your kitchen can get pretty messy in such short amounts of time, you want to work on cleaning it before the clutter gets out of hand. It may sound simple, but the reality is that if you have kids at home, and a spouse that is time-crunched with office work, you may end up taking on the task alone. Many of us delay washing the dishes, and before you know it, you’ve had three meals, and the sink is brimming with dirty dishes. 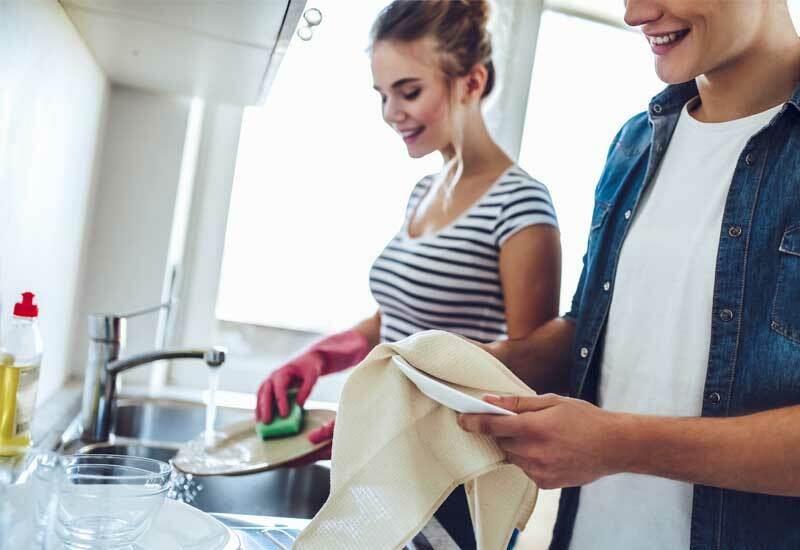 Leaving the dishes untouched for hours or even days may seem harmless, but it is actually the easiest way to spread bacteria around the house. So one of the most important advice we can give is to do the dishes immediately. While doing dishes immediately sounds painful, in actual fact you’ll find that you spend short time periods but do it more frequently. Rather than requiring an hour or more to do them all at once by letting them pile up over a period of time, it won’t be such an insurmountable task for you. If you prefer to hand wash your dishes, simply place them in the drying rack after washing to reduce clutter in the sink and it will save a tonne of time on the drying. If you have a dishwasher, make sure to load up after every single meal to keep your kitchen sink from piling up with dirty dishes and run the dishes on a nightly or twice daily basis to keep on top of it. Starting with an empty dishwasher in the morning will allow you to load messy dishes right away, rather than letting them gather through the day. It’s easy to find yourself distracted from cleaning chores especially when you have to keep an eye on the kids while you are doing the cleaning. To make kitchen cleaning less overwhelming, give the task a clear time frame by setting a timer, and completing the work before the timer goes off. Aside from the clutter that is visible to the eye, you want to make sure that food preparation surfaces are cleaned regularly to reduce the risk for germs and bugs like Salmonella, and E. coli that can grow on these surfaces. Don’t take chances when it comes to getting rid of harmful dirt especially when you have kids at home, the best way is to take a proactive approach and make it part of your daily rituals. If it all sounds like too much however then the best option for this chore is to seek the expertise of professional cleaners who will use the appropriate tools and techniques to ensure that the kitchen is cleaned thoroughly and restored to its showroom shine for you. You may know how to wipe down surfaces, but a person who does cleaning for a living will generally clean more efficiently given the ongoing training they receive, as well as their extensive experience in delivering cleaning services to homes and businesses of all sizes. 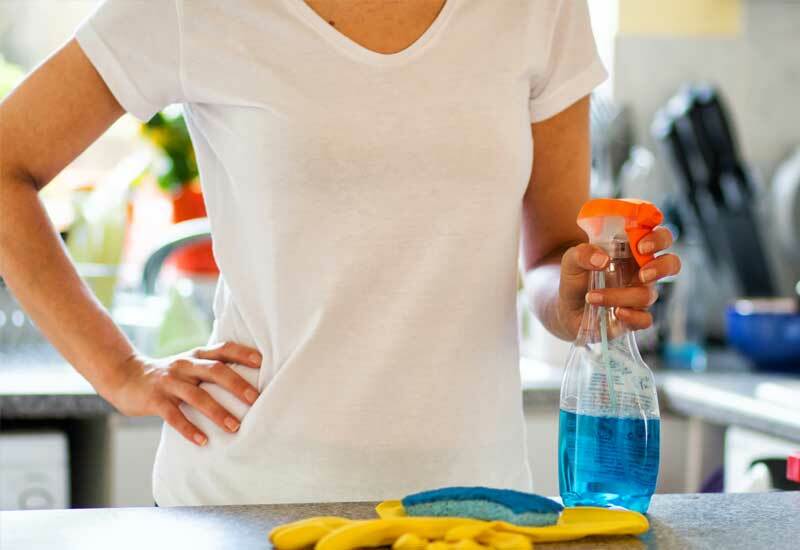 Using a home cleaner can be beneficial for some of those harder to clean areas such as sinks, microwaves and ovens which will talk about more later. Discard food scraps as often as needed. 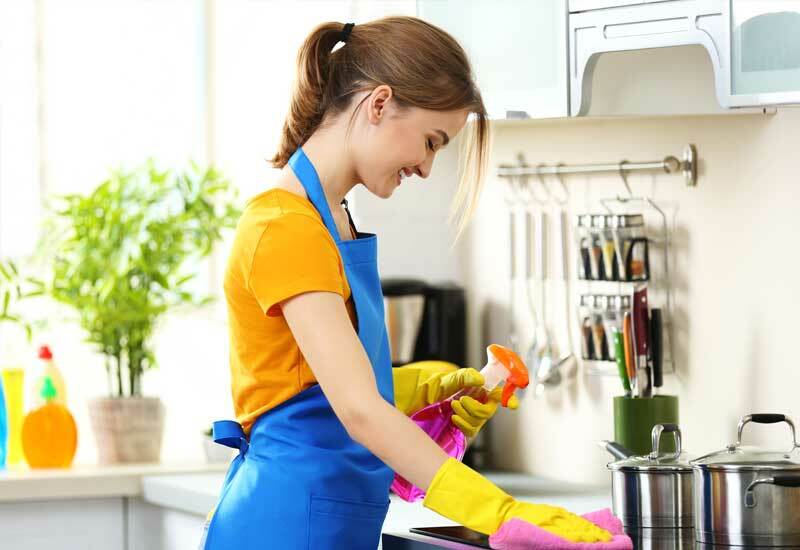 In addition to the daily tasks that you can do for 15 to 20 minutes per day to keep kitchen clutter to a minimum, there are kitchen cleaning tasks that fall outside the list because they eat up a large amount of time when done alone, and can cause damage to kitchen tools when not done right. Some examples of such cleaning tasks include dusting microwaves, wiping down ovens, and cleaning the kitchen sink. These are tasks that don’t necessarily need to be done on a daily basis, as you can schedule a cleaning of these appliances once a week, and with the help of professional cleaners. Weekly cleaning typically involves combining daily tasks with more involved maintenance work such as getting rid of the odors that the sink might be giving off, cleaning the sinkhole or maybe even cleaning out your dishwasher. When dealing with microwaves, and ovens it’s easy for the grime to build out. One exploded bowl in the microwave or a year’s supply of roast lamb in the oven, let’s face it – nobody enjoys cleaning these areas of the kitchen but they feel so good when it’s done. These is where home cleaners can help keep on top of these areas by scheduling a regular cleaner to come in and look at all of the areas that you are struggling to find time for. 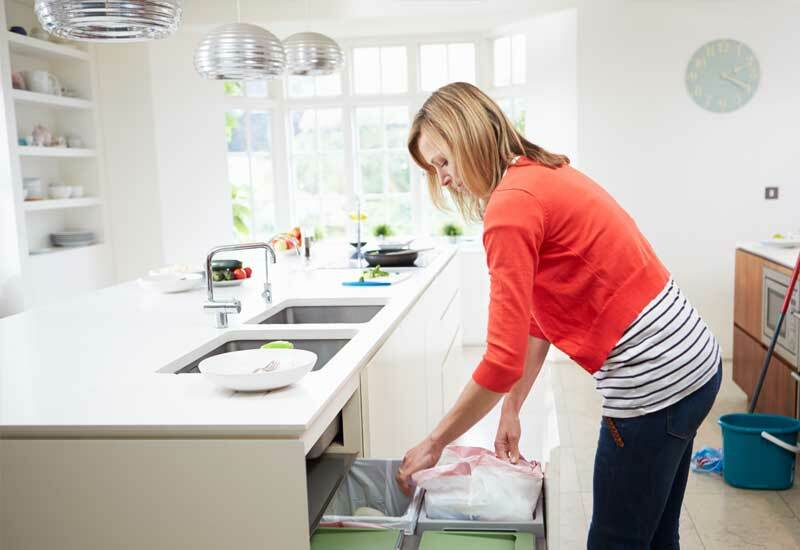 Small daily tasks can contribute to maintaining a clean and germ-free kitchen. But for weekly, fortnightly or monthly cleaning that requires more effort, and demands more hours to complete, hiring our highly-trained cleaners is your best bet. 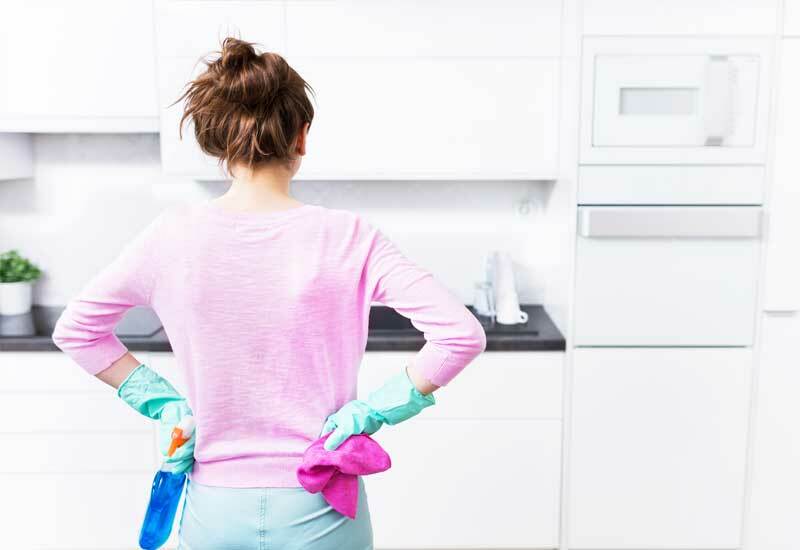 When you’re a stay at home mum, juggling multiple kids, with a partner that works long hours too then keeping your home clean can be an impossible task. The truth is that keeping your home is not only the best way to keep your family healthy but it also improves your mental well-being and makes you feel good knowing that you’re not spending your free time cleaning. Turn over the weekly regular cleaning to us, and we will make sure to work on the areas you may have missed during your regular clean. Simply book a cleaner through our site, and we will take care of everything from there.